The de Havilland School of Flying began training R.A.F. reservists at Stag Lane on April 1, 1923 using Avro 548s and the Hire Service D.H.9s. These remained in use until 1926, the year in which primary training was transferred to Cirrus Moths. The veteran D.H.9s, including the antique G-EAAC, were then modernised for advanced instruction and given red fuselages with metallic gold flying surfaces. 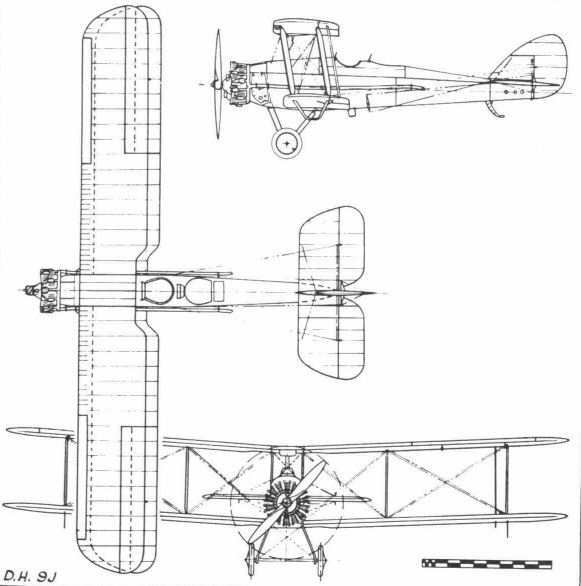 In this form they were known as the D.H.9J, the ultimate variant, with shortened and strengthened front fuselages to carry the heavier 385 h.p. Armstrong Siddeley Jaguar III fourteen cylinder, two row, radial engine, behind which metal inspection doors gave access to the ancillary equipment. The old rigid V strut undercarriage, sprung like the D.H.4 of long ago, by four 6 ft. 9 in. rubber bungees, each wound nine times round the axle, gave place to new D.H. rubber-in-compression units. Aileron circuits were also modified to incorporate the patent D.H. differential gear and Handley Page slots were fitted. An age-old problem which had dogged many First World War aircraft, was at last solved by fitting a gravity tank in the centre section to be switched on during the approach when the air driven pumps were working too slowly to give an adequate fuel supply. The pupil normally occupied the front cockpit, with the instructor in the rear, making it necessary to carry an equivalent weight of ballast when flying solo. In practice it was found that the average pupil with only 10 hours on Cirrus Moths needed but 20 minutes dual before going solo in the larger and heavier D.H.9J. As the powerful Jaguar engine imparted a somewhat lively performance to the traditionally sedate D.H.9, it was necessary to fit a throttle stop to prevent the use of full power. Many of these engines already had upwards of 4,000 flying hours to their credit, having been purchased secondhand from Imperial Airways Ltd. after their removal from A.W. Argosy 1 passenger aircraft. Three of these engines were collected from Lympne in a seized up condition but they too were successfully overhauled at Stag Lane and gave long years of trouble free service in the D.H.9Js. The Armstrong Whitworth Reserve School at Whitley also re-equipped with D.H.9Js, two being erected at Stag Lane in 1926 and a further three in 1929, one of which G-AARS, was used temporarily as a flying testbed for the Armstrong Siddeley Serval IV nine cylinder radial engine. When Air Service Training Ltd. was formed in 1931, all three went to Hamble where their black fuselages and silver wings were a familiar sight until 1936. Two other replacement aircraft were also built at Stag Lane for the de Havilland School of Flying Ltd., one in 1927 and the other in 1929. In common with those built for Armstrong Whitworth, they had plywood covered fuselages. G-EAAC, the veteran D.H.9J which the de Havilland company had preserved so immaculately for so long, acted as a flying workshop for the horde of Moths competing in the 1929 King's Cup Race. Loaded with tools and spares, and piloted by C. A. Pike it landed at Mousehold, Lympne, Hamble, Whitchurch, Blackpool, Renfrew, Cramlington, Sherburn, Castle Bromwich and Heston - ever in the wake of the competitors but seldom needed. The last D.H.9J was not completed until the autumn of 1931, not long before the type went out of service. This machine, G-ABPG, built as an exercise by senior students of the Aeronautical Technical School, was fitted with an Armstrong Siddeley Jaguar IVC and employed on normal training duties by the Flying School. This had by this time been transferred to Hatfield, and PG was almost certainly the sole D.H.9 of non-military origin. The de Havilland Aeronautical Technical School, Hatfield, Herts. Span 42 ft. 4 5/8 in. Length 28 ft. 9 in. Height 11 ft. 2 in. Wing area 434 sq. ft.
(G-EAAC) Tare weight 2,452 lb. All-up weight 3,725 lb. (G-EBGT) Tare weight 2,375 lb. All-up weight 3,900 lb. Maximum speed 100 m.p.h. Cruising speed 80 m.p.h. Stalling speed 48 m.p.h. Climb to 10,000 ft. 9 min. * R.A.F. serial of military original. D.H.9J G-EBGT, c/n 82, of the de Havilland School of Flying showing the 385 h.p. Armstrong Siddeley Jaguar III radial and rubber-in-compression undercarriage. Development flying of the 340 h.p. Armstrong Siddeley Serval IV radial was done with D.H9J G-AARS of the Armstrong Whitworth Reserve School, Whitley. A number of D.H.9s were fitted with Jaguar engines and D.H.50 centre section tanks by the South African Air Force but they did not have the airframe improvements of the British D.H.9J. The ancient D.H.9J, G-EAAC, in its Moth support role during the 1929 King's Cup Race.